So pure and sacred are the thoughts of Our Mother, the Earth, that Her hair grows long and fragrant. The Sweet Grasses found growing around the World represent the hair of Our Mother, the Earth. These special grasses have long been collected by the Native Peoples of Earth to use as incense (to perceive by the senses) for physical and spiritual healing, celebrations, for sacred prayer and purification rites. Loving All Her Children, the Earth allows us to share in Her loving intent and Her perfect and purifying thoughts. On the Medicine Wheel Sweetgrass sits in the North position, the place of Water/Consciousness, the Place of the Minder of the Universe, and the Soul of Man. In many countries around the World, Holy men and Holy women are recognized by the length and glory of their hair. The cutting of hair by oppressors has long represented the submission and defeat of a People, through humiliation. The Language and Sacredness of Hair is taught by All Tribal People of Earth. The way a People comb (the Alignment of thought), braid (the Oneness of thought), tie (the Securing of thought) and color (the Conviction in thought), their Hair is of great significance. Hair styles are important for they portray and announce participation in various events and the feelings expressed by People; the state of merriment or mourning, at a given time, or a stage of life; whether one is coming of age, marriageable or married, one's age and tribal status. Hair can depict the Tribal Spirits one follows given the geographical location of a Peoples and the Spirits flowing through someone depending on their age as a Spirit and the spirits that one is calling on, in a given ceremony. Different styles signify the Tribe one belongs to and are worn to indicate times of peace or war. Hairstyles like seasons change for public, private and ceremonial occasions. Hair represents the pure thoughts and spiritual status of an Individual, showing the bonds and spiritual oneness of a Family and defines the cultural harmony and spiritual alignment of a Nation. 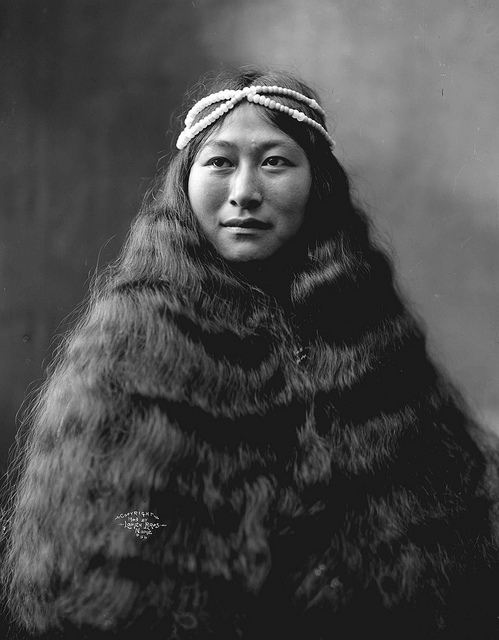 Hair represents the Pure and Spiritual thoughts of All Tribal People. Everyone is given Straight or Curly hair, depending on the Creator's discretion. Straight, flowing hair, teaches of one that can gracefully hold or let go of life. Thoughts can extend in a uniform manner, flowing directly from the source, like the movement of water flowing from the mountain top to the ocean, and then the water can rise up again to fall once more. For those with Curly hair, they will have the potential to understand the Spiral, Curve and Energy of Life. Their thoughts teach about the decrease and enlargement of life's movement. The winding, circular energy of movement and growth on the Earth. All thoughts in life tend to ebb and flow. Native Children are taught from a young age how to groom and care for themselves, their immediate and extended family. They are taught that grooming one and other, unifies the bond of a family, caring for one and other strengthens the family ties, respecting one and other maintains family harmony and loving one and other defines a family's pride. They are taught to correct one and others appearance and habits, to strengthen one and other continually, causing them to be beautiful, strengthening in them the ideal that they are an extension of the Creator's thoughts of Love. They emanate from the thoughts of Perfection and strive to become (to pass from one state to another and to enhance) Perfection. As Children are raised up, so too is the spiritual level of teaching raised, to elevate their Spirits. In youth and innocence (in-knowing-sense = freedom from guilt, sin or pain), Mankind is blessed with a bounty of beautiful hair. The more pure and sacred your thoughts, the longer, healthier, and vibrant, your hair. As Humans age and loose their innocence, falling off the Path of Light, harboring dark thoughts, losing the light of pure thought, Humans loose their hair and the shine (aureole) it once had. Caring for hair is very important, for like the Sweet Grasses of our Mother, the Earth, our hair holds the purity of our intent. For our thought can purify the thoughts of others. Native Children are taught to wash and rinse hair, and are taught the proper use of the gifts of the Plant People; learning which bulbs, roots and herbs, will bring luster and light to ones hair. Maintaining the health of ones hair is important, as is maintaining all physical and spiritual health and wholeness. They are also taught combing rites. Special combs were and in some places still are used for the Sweetgrass Rites and ornate combs were and still are made for Human hair. Careful consideration is given to the types of woods, bones, metals, jewels, and brush materials, as well as the symbols and (spirit) designs, for the best physical and spiritual purpose, of the task of combing Ones hair. The Porcupine shared itself by giving Native Women a Sacred Comb, which was made from the bone found on the underside of the Porcupine's tail. After taking the skin off, drying it and making a wooden handle, it was ready to use. Combing is the act of separating and adjusting the hair so that it will lay or move in the best or most beautiful way. 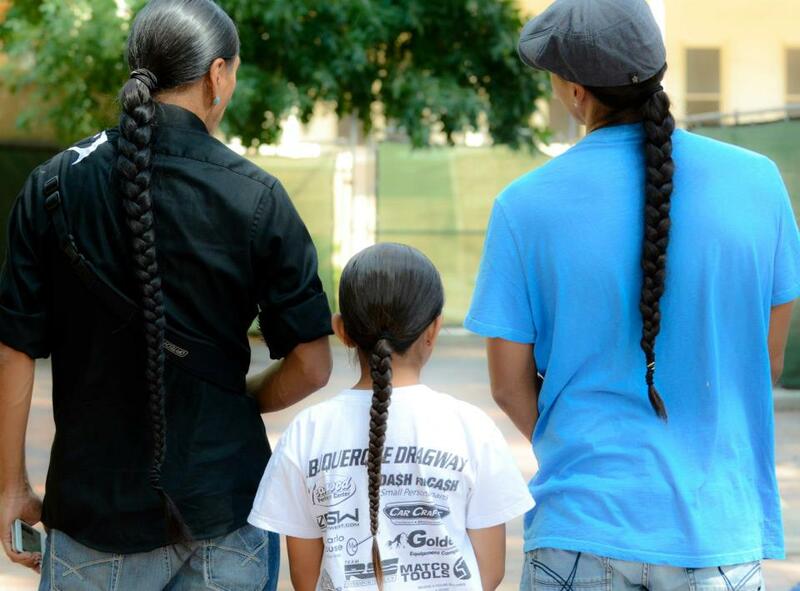 Native families, knowing that our hair is the physical manifestation of our thoughts, also understand that our thoughts need to be corrected and adjusted by the Creator, so that we will move gracefully along the Beauty Way, the Sacred Path of Life. Your hair teaches you that your thoughts are to flow in all directions but are to be informally directed. Yellow, Red, Black and White the four colors of hair symbolizing the major directions of Earth, and the direction of those constant in the flow of thought/ Spirit. Also, the four directions in between, Gold, Orange, Brown, Blue/Grey, Hair indicating those continual in thought/Spirit, flowing throughout the Universe. Your hair is just one way of indicating to others another conviction you carry throughout your lifetime. When the color of your hair changes, naturally, that means you have been Elevated, by God. You have more responsibility in and for Life. You were given a sacred color of hair to wear and you were never to bleach (whiten) or dye your hair. Even the word dye/die when used for coloring states the death or divination of a God-given thought and purpose. Dying (destined for death) ones hair places your desires before the thoughts of God. Bleaching ones hair to change spiritual status, does not make one an Elder or Pre-dating Spirit, for you are born who you are, chosen, and elevated by God, not by Mankind. In Native ceremony when ocher and hennas were used on hair it was understood that it was for a Sacred purpose and Spirit (God) inspired, and the natural color would naturally return. Other tribes, remembering that they are Spirits that live forever, cut their hair after a year of mourning. Symbolic of the severing of their ties, freeing the spirit of their loved ones, allowing them to enter the morning of the next world. Ready to start a new life, knowing they must respect and honor their loved one, they feast and urge their loved Ones' spirit on. Demonstrating their love for all life, they signal they too are ready to start a new day, a new morning. For in wisdom, they except the greater cycle of life. They know the Body of their past Love, was given back to the Earth and the Spirit of their Loved One, needs to return to the Sol/Star their Spirits emanate from, to be re-aligned in the Body of Oneness, being reborn as their future and the renewed Children of Earth. 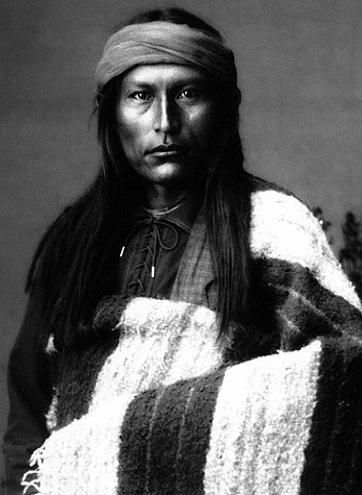 Young men are often seen with braids of sweetgrass for personal purification rites. In some Tribes, men weave sweetgrass into their braids to unify their thoughts with their Mother, the Earth, strengthening their thoughts of Oneness. This demonstrates the way in which hair is used to extend and bind your thoughts with others. By attaching a lock of a loved ones hair, in your hair, or by carrying their hair on your person, One is able to carry the thoughts of their loved ones with them on their travels. It is so important to have your families spiritual support and protective thoughts (prayers) in life generally, that the hair of ones family and the hair of their protective spirits, was braided into a warriors battle dress for added strength and stamina. It is generally understood that you do not touch a person's hair without permission. Sweetgrass headbands (the things that keep your brains in) (joke) are worn for concentration, to purify thought. The aroma of sweetgrass clears the mind. Sweetgrass necklaces or collars refer to the Spirit that is born head-first, and is used to call-in / collar the Spirit of Wisdom you are descended from. Sweetgrass braids, like the braids on your head symbolize the serpents of wisdom, that keep you on the Sacred Path of Light. It is the double-headed serpent that warns you with a shake of its tail, should you step off the path of light, to get back on the sacred path or suffer the venomous bites of despair, depression or death, depending how far you wander. Braids symbolize Oneness and Unity. The flowing strands of hair, individually weak but when joined together in Oneness, physically demonstrate the Strength of Oneness; "One Mind, One Heart and One Soul", the Song of the Uni-verse, and the Sacred thoughts you are to hold. There are times to wear the hair braided and times to let it flow free, different times to demonstrate your harmony with the flow of life and to demonstrate your thoughts of Oneness to others. There are different teachings about the way to braid ones hair, and different teachings about the ways and rites of braiding Sweetgrass. One way is to gather 28 whole strands of Sweetgrass, one strand symbolizing each sacred day in one moon(month). Divide them in three equal piles, 9 strands each, each pile symbolizing the wandering spirits of the 3 tiers of Heaven (upper world, middle world, lower world), and with the one strand that is left, the strand that Symbolizes the Great Spirit, the Creator God(Father Sun), you tie all the loose strands together. Remembering as you braid the Sweetgrass, to keep your thoughts and intent pure and healthy, placing the prayers of love for life into your braid. It is the intent placed in the medicine that makes all healing possible. To end the braid, tie a knot with the grass. A Knot is symbolic of Union and a Bond. The Tie that binds. The knot in the Sweetgrass braid also binds all the "thoughts" of our Mother together, to teach us, once again of the strength of Unity or Oneness. Know it is only the Creator's power that holds the Universe together and the wandering spirits are His Great Spirits that flow and protect Life all the way to the outer edges of the Universe and the 3 tiers of Heaven are the lower, middle and upper worlds or the Sea, Earth and Sky(Universe) where all the Great Spirits dwell. Keeping thoughts of Love and Respect for All Life in your Mind and Heart, allows one to share the Sacred Sweetgrass with others in a good way. When working with the Sacred Medicines, our intent should be as pure as the intent of our selfless Mother, the Earth. She wants only the best for Her Children. So hold Sacred thoughts; thoughts of Oneness and Healing thoughts; thoughts of Empowerment and Love, when braiding and using Sweetgrass. Soon All Nations will be strong again. Responses to "Elders talk about the significance of long hair in Native American Cultures (Videos)"
i think it is wonderful and has enlightened me a little. 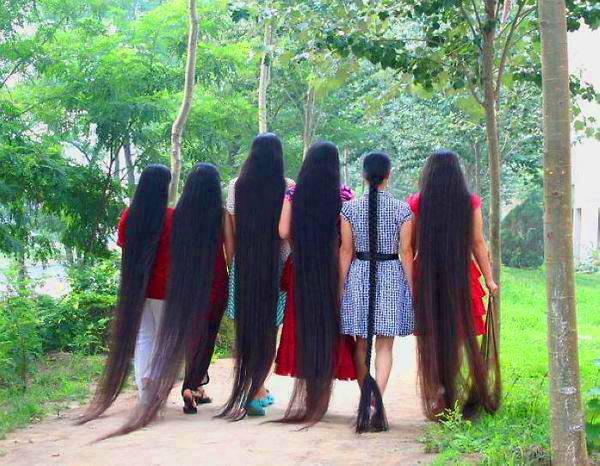 I just wish I had the thick long hair of the Native Indian, it looks so healthy. Most interesting . Genetic yes. A very interesting read indeed. May i share some of your writing and a pic with friends please? Love this article.. and so true.. Thank you for your teaching. I live in Ireland. I always needed to have long hair (it's curly) and I wouldn't let anyone cut it but till now I never really understood why. Recently my hair has become ill. I will pay attention to my thoughts and burn a sweetgrass braid. Thank you. This was fascinating. As a child I had thick curly hair that I was encouraged to cut. I always hated that. Now I know why I love my curly hair and do not straighten it. How beautiful and also sad some of these stories are, to which I knew so little. Thank you for sending light on this subject to us. Thank you for sharing this beautiful tradition of your culture. This article helped me to better understand the ways I was brought up in terms of my hair. My father, an El Salvador Maya gave my mother specific instructions on how to take care of my hair as a child. Things that were mentioned here I have done unconsciously for the same reasons they are done by American Indians. For instance, cutting the hair after a year of mourning or grief, and starting a new beginning and flow of thought. After reading this article, I am deciding to continue to treat my hair this way, but consciously and with more meaning. Thank you for this. My hair is very long and had belief before that a certain amount of you and your magic is in your hair. This gives more sentiment. I don't think I will be cutting it any time soon either. Pretty deep. I have always wanted long, flowing hair, but because I am black, this has not happened for me; does that mean I am denied the wisdom of the ages? I now have a greater understanding.repect and love for all that is. I thank you for sharing and hope to use this info in my walk through life. I remember when I was a child and I went into a foster home. The first thing they did to me was cut my precious long hair. They cut it to my ears, and now I can make the connection between what happened to me and what I have read. Yes I'm Native American, I have 5 Clans in my lineage, yes 5. I mixed with French but the Native never left any generation so I always identified with my Native inheritance even though I was urban and had 5 siblings. We all knew we were Native. My hair length meant everything to me all my life. When they cut my hair off, they cut of the memories that I had with the years it took me to grow my hair. I cried and cried, they traded my long hair for short lice infested hair. I could always connect to the need of my hair and still do today. My health has been weakened and so has my hair , however it still grows past my shoulder's. I will not cut it. As soon as I got out of foster care, I let my hair grow back to very long again and not too long after, I was involved in AIM in a financial way, by making contributions in any way I could. Since then I attended Native American Counsel's and got educated. I can so well understand the philosophy behind Aboriginal Peoples importance of hair. Even in Biblical times a woman's beauty was her hair. So it would be difficult for one to disagree with these passages no matter what their inheritance. Thank you for sharing what my Spirit already new, but could not find the place to rest this belief. dms. How would illnesses such as hypothyroidism or celiac disease or other which effect hair growth, health and shine, fit into this: "The more pure and sacred your thoughts, the longer, healthier, and vibrant, your hair. As Humans age and loose their innocence, falling off the Path of Light, harboring dark thoughts, losing the light of pure thought, Humans loose their hair and the shine (aureole) it once had." ? I ask, because I have such illnesses and have been long missing the full, healthy hair of my childhood. Is this symbolic superstition, or is there a possible connection between emotional/mental outlook and the development of these dillnesses? I've long believed there is, and that it is a strong connection. I've long felt there were major gaps in my education/klnowledge, and this is one of the few wellsprings I haven't come to yet. I'd be open to almost anything which might help me to change the direction my health is taking, and I would welcome the opportunity to know more about that aspect of my ancestry. Those are the ancestors who speak to me most strongly, not the English, Irish, African or whatever else. I've always resisted having my hair cut, and each time it was has been a traumatic event marking my memory: "before my hair was cut" and "after my hair was cut", like other people remember "before Dad died" or "Before I lost my job". :) While I wasn't raised indigenously, I have always had quirks in my personality like this that have always felt stronger than any conditioning or examples otherwise. Maybe understanding what I think are echoes of my ancestors by learning the cultural ways and medicines would help me. I'd like the opportunity to discuss these things with you. May I contact you, or would you consent to contact me? @copperdots Absolutely not!! You have curly hair. Do you let it grow out? It is, in it's own way, long and flowing already. Re-read this article, take to heart about what curly hair means. @ hypothyroid and celiac sufferer. We don't have these diseases. I can tell you this: Cut soy and wheat completely out of your diet (not just gluten). Then your hair will grow and shine and you will not suffer anymore physically, and your thoughts and feelings will not harbor on suffering, pain, swelling and sickness (bad thoughts). Instead, you will focus on life, love, things you enjoy doing with your loved ones (good thoughts). That is how it fits in. Does it make sense yet? Give it a try and report to White Wolf with your results. i have long hair and have always had long hair, but for reasons beyond my control, I had to cut it. I started growing my hair at the age of thirteen until 1990....but I still grow my hair and would not ever think of cutting it again,ever!!!!!!! Thank you so much! This was very insightful. A lot of things have become clear to me ....for instance I did not know why people shave off their head when relatives die. Now I know. Loved your article. My grandmother was Cherokee and her hair touched the floor. She always said a woman's hair was her crowning glory. Thank you so much for your article. My mother had really long hair. When the twins died in childbirth, she cut her hair short. Only when her grandchildren were born did she grow her hair out until shoulder length. My grandmother also had long hair. So many subtleties talked about hair while growing up with my Algonquin mother. I have wavy hair. When I was in my teens it was the fad to straighten hair out with an iron or chemicals. I tried it. My mother thought it was crazy. Now, as a young elder, I have let my hair grow long and wavy and know that I receive energy and thoughts about water and how it moves and how patterns move throughout the planet. So good to talk about hair - what a blessing! My long hair is very much a part of my spirituality, cutting it would be like cutting out part of my soul. Growing up, my mom always cut it short. I always hated it short and knew there was something missing in me...now that it's long, I feel more complete. 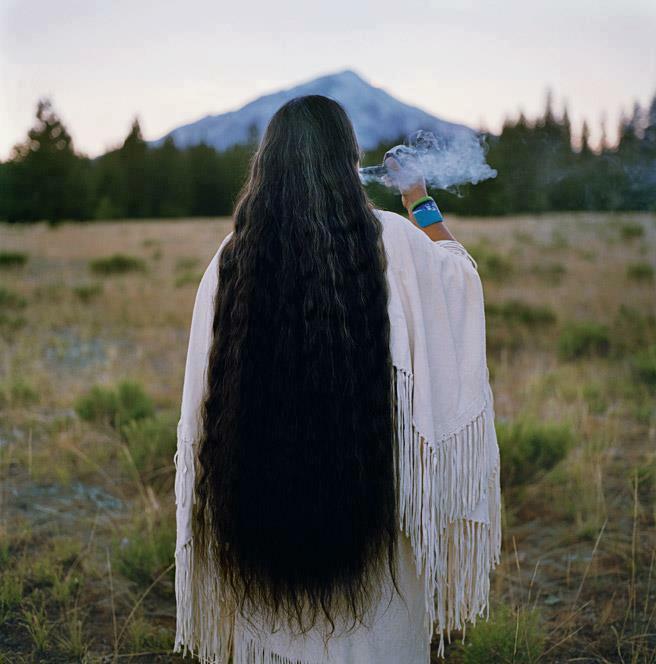 My long hair is part of the ceremony of life and gratitude to Spirit for me. I am a Cherokee decendent with long black hair. I do this as a respect to my people. you realize this is revisionist and false? People have so romanticized natives that people believe all sorts of baloney like this. My Father is of the Inuit People my hair made it to the back of my knees and that was it. Change is hard to make, but growing out a shaved head is the worst.. lOL> Long live long hair!!! I am Dine and Acoma...I have always had long hair. However Ive always died it a lighter color since I was a teenager (now 38) and latley ive been asking myself why do I like my hair orange? Hahaha...contemplating going back to my natural color after 20 years? Maybe this is why...thanks for the knowledge. when I was in the military I had to cut my hair and I hated it. Now it is back to my knees where it belongs. please let me know if this would be ok I will of course fully credit and link back you your work. now it makes sense. Growing up my father never wanted our (my sister & myself) hair cut. Made it real clear to mom. When we were older he told us to never color our hair. We always thought that he was very old fashioned. Asked him about it & he said his mother told his sisters this & said that it was passed down on his mothers side of the family. His mother had Cherokee in her background, way back. In the early 1800's I think.I have 2 daughters & I never cut their hair when they were growing. Learn about herbs and follow a (raw/natural), ripe, fresh, organic vegan lifestyle, eat before 7pm, sleep at 10pm and get up with the sun....Research and trust nature! Would you mind if I translate this article into Chinese in my blog? Thank you! I think maybe your hair will grow long another way, perhaps locked in dreadlocks, all your thoughts will grow and add on and stay with you until you decide. What if you prefer your hair short? Is that a disrespect? Is it wrong? Thank you for this post. I have always had a great love and respect for the Native Americans and their diverse culture. Thank you to each tribe et all for all that you have given to America as well as done too. May each of you, your families, and tribes be blessed. Why do you question this great article? Native Americans had the right ideas about life in general. No, I am not of native descent, but; have had a lot of respect for them and the way they thought, before the "white people" came along and spoiled it for them. Thier respect of others and animals could be used today! Thank you for this great information. I have long acknowledged that Native Americans had the right ideas about many things. I am proud to be able to say that none of my ancesters were involved in the terrible treatment they recieved at the hands of europeans! Thanks you for giving out this information. I am a Native American that was separated from her roots when I was little and have been trying to find some information on some of the culture of my people and it has been difficult. This article is wonderful and now I understand why I always felt there was an importance to the hair and braids. Thanks again. My husband passed 6 months ago, his wish was for me to never cut my hair. I am chickasaw, he was not. What should i do? Hello, I'm from the UK, I'm 64 years old and still have long hair past my waist, I still have my natural colour, ( not grey yet ) although when I was younger I did cut it sometimes and also highlighted it to lighten. The problem is it has gone much thinner, I don't wash it too often, mainly because the hot water boiler isn't working properly! I began brushing it with a boar bristle brush but find every time loads of hair coming out, tonight for the first time in ages I decided to just use a comb, and although some hair came out there was not as much. Are you able to tell me why my hair has gone thin? I love my long hair, but I don't wear it lose much these days because it begins to appear straggly very quickly, it is a shame really because people use to comment and say how lovely my hair was. Another reason I do not cut it is because it says in the bible that God gave us our hair for our glory and a covering. Thanks hope you have an answer for me. I Loved this Article. Thank You So Much. I am so sorry for your husbands passing sister, I also lost my husband 5 yrs. ago, and the only advice I can give you is do what you feel is right to honor your husbands memory. if it was his wish for you to not cut your hair and you feel it is right in your heart then by all means do not cut it, my husband was of Cherokee descent and didn't want me to cut my hair either so instead what I did was I braided one long braid underneath and I cut that... I also did that when my father passed and I buried it with him, my husband was cremated so it got burned with him. and my hair is still proudly over 4 feet long. Blessed be. I have long hair always have once had it cut short and ended up in hospital due to hair cut, my body and hair are one with me and the doctors told me never to do it again. As it would happen again so it grew and I had 2 nd child so I cut it again not thinking another 2 weeks spent in hospital, I suffered sweats, fevers and literary felt like I was dying.. It's now back to my bottom and I regularly cut only a centermeter off to keep it healthy. I've always instinctively understood the meaning/power of hair but years back when I came across info from a native source , and have most of my life chosen to have it very long however........I am looking for a deeper meaning about white hairs and how natives/elders don't recommend dying the hair as it kinda means preparing for death? I have extremely dark brown (often appears black) and have had lots of white hairs since I was 18 years old , now at a fast approaching 38 (look bit younger) I am tired of dying it and want to stop but so far can't seem to do so. ANYONE OUT THERE CAN enlighten me further on this specific subject/sub-section of the significance of hair? Absolutely in love with your blog. Great work! This post has been very helpful I can't wait to use some of these ideas. Very interesting . Rethinking Hair.... Thanking you. I agree with the above. Dump the grains and starch (all sugars, all things made with flour and all starchy vegs) and you will be amazed at how much better you feel. PS - My hair is now close to knee length, thick and wavy. Genetics obviously are part of that but at 60 I still have a massive head of hair and diet is a big part of that. Thank you De esse for this advise, I will give this some serious thought! my hair is long, below my waist but thin! I'm over 60, but I'm not grey yet! Thank you for this information about the ways in which hair, how it's cared for and how it's worn can hold sacred significance. Even as a woman who does not have native ancestry, one of my most traumatic early childhood memories is when my mother had my long hair cut into a pixie (think Mia Farrow in "Rosemary's Baby"). My hair was kept short until I was old enough to choose my own hairstyle; even then, it was a constant battle between my desire to "grow out" my hair and pressure to wear my hair short in order to please my parents. I regrew my hair after the death of a friend in 2005. Since then, I've cut it once: four years ago, when a friend was diagnosed with cancer. I feel more mentally & emotionally balanced, more feminine, and more spiritually connected when my hair is long. I typically don't wear my hair loose except in private. I don't like it when people touch my hair without my permission--it's uncomfortable in many non-physical ways. As one who had a childhood in which both parents were abusive, including sexual abuse, my hair has helped me heal. It's helped me connect with my femininity, and it's helped me learn to accept loving, nurturing and healing touch. When someone pressures me to cut my hair for no reason, I now wonder what's wrong with them. I recently cut my hair short.. the first time I have ever had really short hair.. but I feel less depressed than I have been in the last few years.. this is my new beginning. and I feel it, I am more sensitive to all around me, and this feeling is growing stronger everyday. After reading this I now understand why I cut my hair, even if I didn't know it before my spirit did know what I needed. Chi-miigwetch for the teaching. I am a non-Anishnawbe working with an Anishnawbe community here in Canada. The question of the importance of long hair (especially for males) has been a question to wich I have received many different (but not contradictory!) answers. What I have read and watched here has added to my understanding. This aids in the understanding and appreciation of just how sophisticated and rich Native cultures are. Sadly, my ancestors have missed out on such an amazing opportunity to become richer as a people through the understanding and appreciation of Native American, First Nations, Metis and Inuit culture. As I learn, my son learns. As the teachings are shared with me, I share with my son. Years ago, in my early thirties, a Native American woman (I think she was Apache) approached me smiling broadly while in a store, and claimed "Holy Woman!". I asked her what she was talking about, and she insisted I was a Holy Woman- I told her I was so far from being Holy, it would take a long,long time for that to ever happen and that she must be mistaken. She said, "NO!" and kept insisting that I was, indeed, Holy- she had pointed to my 'band' across the top of my head which is a distinct whitish silver(goes ear to ear across the top of my head, about an inch or more wide and runs the full length of my hair). She and her family were speaking their native language and in a state of what I can only express as awe, and smiling. Would you please tell me more about this? .I don't know that any of my ancestors have had this band. I very rarely allow anyone to touch my hair, as it is discomforting. My hair 'feels'- it's the best way I can describe this sensation. I also have an 'issue' with electrical/electronical devices- they tend to 'go haywire' in my presence (my computer tech finds me quite odd; he witnessed the radio changing stations wildly every time I walked by it, stating he had never seen anyone do that ever- at least not to the extent he witnessed with me). When my computer or other device acts up, he always laughs and says 'what did you do it it NOW? !, knowing I did nothing except 'BE'. My hair has changed colors several times throughout my life, of it's own accord.It was reported to me that it was red when I was born, changed to dark brown, then more blondish, then light brown, then carrot red/orange- at which time I had a discussion with God that I did not WANT red hair and requested it be brownish instead.. It then changed to 'mousy brown' and fairly stayed that way most of my life. It is now interspersed with silver, but the band is still prominent and whitish silver, as it has been for years. I get red highlights in the rest of my hair in fall and spring. Children have always approached me -again in a state of excitement and awe- exclaiming that I have 'rainbows' in my hair. They tell me I have "SO many colors" (their parents are always embarrassed because they want to touch my hair; I let them- they are the only ones who don't make my hair uncomfortable). These children swear they 'know' me! I don't recall ever meeting them previously, but they are certain that I am their friend from long ago- these are very young children. One girl, about 5 or 6, is quite insistent that I am her friend- She breaks away from her mothers' grasp,and she runs to me and hugs me every time I happen across her, exc;aiming 'My friend! My friend! I have missed you So much!'. Her mother is greatly unsettled by all this display, and apologizes profusely (although it is not necessary). She manages to drag the child off, admonishing her, and all the while the little girl is yelling at her 'But it is my FRIEND! ', arguing with her over being taken away when she finally got to see me. It is all rather odd(to me), but they are so genuinely certain that they know me, and it is clear there is great love being expressed. I have no idea why this happens to me, but the children seem to know something that I am unaware of. It is not every child; just a few- but they are adamant that they know me, and are very close in heart with me. I do not know whether you can shed some light on any of this, but would appreciate any insight you may offer. Please, also, if you'd be kind enough to share with me, would you tell me the significance of this band in my hair? Thanks you so much for your time and consideration. What about september..September: "Moon When The Calves Grow Hair " how? What does it mean? my mom taught me how to care for my long hair. Braid it every night she would tell me. I still have long hair and the last time I cut it was when my mom crossed over. I am 1/4 Cherokee. My mother is white and I have lost my culture. I have long hair but has been cut several times throughout my life due to morning or illness. It makes me sad to cut my hair like a sence of loss. I now know why, and why I cut my hair after morning. Very good article. It explained a lot to me about how I've felt for a long time. A good friend of mine cut her hair off when her mother passed away, and she talked a little about it. Now I understand. Thank you. I'm very blessed by everyone's comments and stories, so thanks everyone for sharing. This made me think because my sister and I were adopted at a younger age by white people. I always felt like they tried to get my sister and I to act like them rather than embracing our own culture since we are part Cherokee.I even remember them cutting my sister's hair short and she Hated it! (our birth mom saw it cut short visiting us and was so mad she choked our adoptive mom.) Now I understand. My hair is naturally curly but now it's relaxed and growing long in memory of my Father. I know I'll gain knowledge from the life he lived. I'm non-native that I know of, and my mother always cut and permed my naturally fine, straight, hair. So I have no family picture of what I looked like as a child as far as real hair goes. Mother asked me what I wanted for my 9th birthday and I told her "A ponytail" (code for stop cutting my hair off) and I wanted a new doll too but asked her to not give me the doll but instead, to please just give me the present of NOT cutting my hair anymore and no more perms. Grandma had 3 ft. long hair and I wanted long hair of my own, not to copy her but just because I felt it was me. I was so relieved when Mother gave me my birthday present of NOT messing with my hair ever again. And to my surprise, she also gave me a new doll. Now that was the greatest present I've ever received, my long hair!! Now that I am retired from corporate office work for which I maintained a layered cut, I am free to have my own long straight hair back for good! And sure it's thinner than it once was, that's true, but the point is it's back to where it feels normal again, which is Long. I think hair must be like a limb. To cut it off feels like cutting off a limb, maybe I knew that as a child, I don't know. But when she'd cut it and even change the texture of my hair with those home permanent waves, it felt so wrong, it felt insulting to me, that I wasn't good enough the way Nature made me. I must say, I'm so glad I'm free to be who I am, and not have to follow other people's hair rules. I wouldn't be young again if you paid me to be. Well I really enjoyed your article and learned so much about Native American hair. I felt it had deeper meaning, but thanks to your article, now I know it does and I thank you very much. I understood a lot from this article. I have always had long hair and would only let my mother cut it until I was 11 and I wanted bangs and we went and got my bangs and the lady cut my long hair off. I cried for almost 2 days straight off and on. I have always taken care of my long hair and only cut it at certain times. Now I will follow some of the things I learned from this article and always keep my long hair, I am 60 and was told I should cut my hair when I was 21 by my Russian grandmother that it was wrong to have long hair and have a baby. I had given birth to a boy about 3 months earlier. Thank you for explaining what I have felt about my hair. I am of Sioux heritage and different cultures mixed in, but always leaned to my Sioux knowledge. My parents respected my need to have long hair. I never have hurt my hair and only cut it when it feels like I I always let my son decide what length his hair should be. Hair is very personal. Thank you for the lesson. Thank you for writing this article. It explains a lot especially why I fought my Mother as I grew up. She demanded that I had short hair, something I definitely was uncomfortable with, and I wanted long. Thankfully my wonderful Dad put a stop to it- he understood my need and put a stop to her demanding in that area. My only problem- it gets to a certain length (half way down my back) and won't grow any longer. Wish I knew why. To promote growth, trim 3 days after New Moon (or when Moon is in Pisces). Also, hot oil treatment once a month: Olive oil, mixed with Arnica; massage into hair/scalp before bed and wrap in towel(then sleep);wash out thoroughly in morning. Hi ya. Would a man care and braid his hair himself or would his allow someone else to do it for him? And is their any significance of someone else braiding your hair? Would it be considered a taboo for the Sioux to have someone other than your family braid your hair? 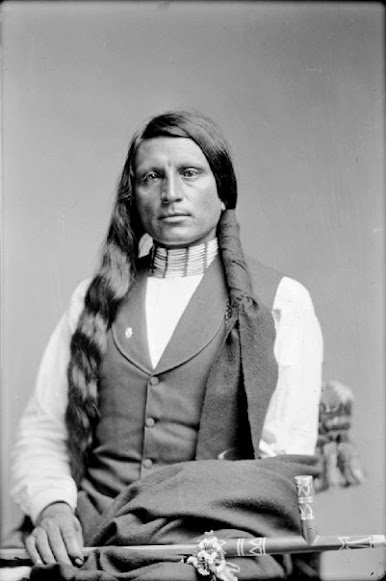 so does anybody have any infirmatiin specifically on cheif long hair of the crow nation? 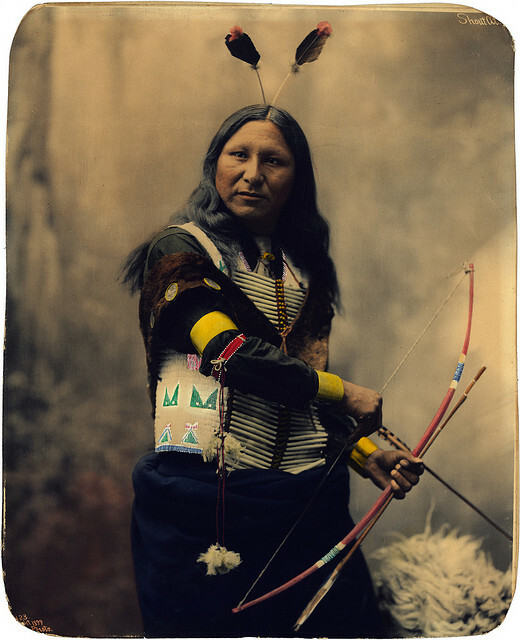 legend has it he had hair 25 feet long but i cant seem to find any real info on him other then a few lines in a few different books and articles. My grandmother was mixed and we are the only ones with dark, curly, very thick hair as we age it still grows very fast as do our nails. Born in OK but had a grandfather who walked the Trail of Tears, not sure if he made it. My grandmother considered herself from TN. We have no black blood so not sure why she and I are the ones with curly, very dark hair as the others do have a lot of hair including the men but they are much lighter than she and I. All my life I had long hair down to my waist and trimmed it to maintain at that length, when my dad passed away, my mom cut my hair up to my chin. it's just what is done. my hair doesn't define me, it is very telling of my emotional state though. my friends always put flowers in my hair when we meet up these days just to cheer me up and to honor my dad/loss, it's been 2 years, my hair gets longer everyday as does my resilience and my strength without my dad in my life. O Si Yo to all.... All my life I had to have short hair, my mom always cut my hair short. I hated it. I felt every time she cut it my heart would break. As a young girl I had polio and rheumatic fever and was unable to walk for many years. Then I went blind from measles. Now I am 63 and have let my hair grow, it's thin and white with 2 dark stripes that run down the middle and it's all natural. I vowed not to cut my hair ever again and recently been diagnosed with cancer, now my hair is falling out from chemo and me being sick. I have shaved my hair because most had fallen out. I sent my hair to a wig maker and now I wear my own hair as a wig.